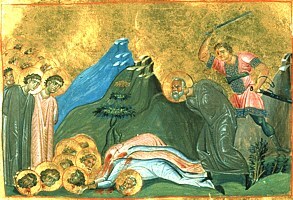 The PriestMartyr Sadok (+ first half IV Century) was bishop of a Persian district. When the Persian emperor Sapor learned that Sadok was preaching faith in Christ, he gave orders to arrest and imprison him together with 128 Christian believers. For several months they attempted to persuade the righteous to repudiate the holy faith, but not accomplishing this, they executed them.